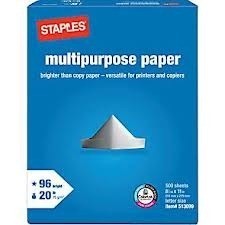 Head on over to the Staples.com Coupon Page to print off a couple new coupons that will score you FREE deals through 3/30! Note that you can only use these in-store. 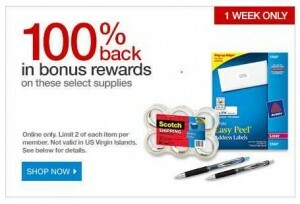 If you’re a Staples rewards member, then CHECK YOUR EMAIL…I received one today for $5.00/$25.00. When you pair that with this weeks promotion on $1.00 Hammermill paper (after rebate), you end up looking like FREE paper – that’s 2,000 sheets!!!! Hurry over and print out this coupon – present it at Staples and get a FREE Reusable bag, and on top of that, anything in the bag…15% off!!!! Note: See coupon for details and restrictions. 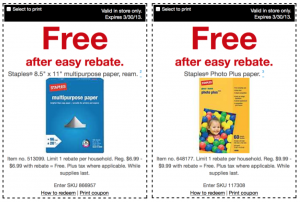 Here we go again…Staples is giving us another FREE ream of paper (after PRINTABLE COUPON and rebate). 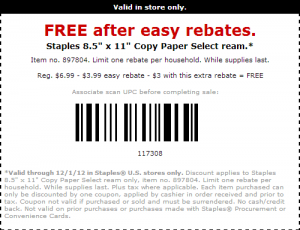 You can click the graphic above, print, and use it at Staples to score FREE Copy Paper (after rebates)!! !